Soul Foundry + Clever Impersonator. Why does this make spirits? Isn't that the exact opposite of what the card is portraying. With Kaya's Wrath and Ethereal Absolution, is WOtC trying to remove the ghost flavor from the Orzhov? I think that's one of the best parts of them. If not, will we see more ghostly legendaries with the council gone? 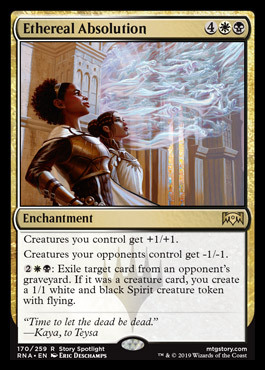 The Orzhov mechanic is Afterlife and it makes ghosts! I think they're freeing the spirits from indentured servitude, but some of those spirits then decide to voluntarily work for them or something.